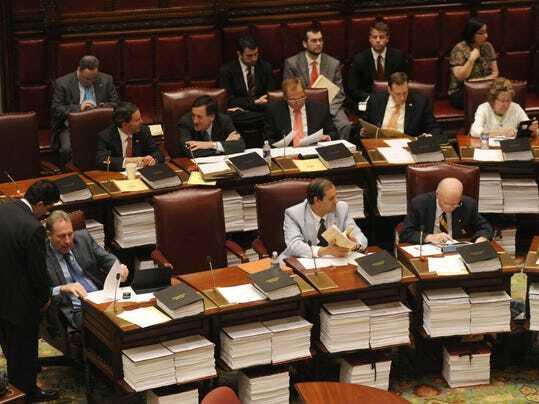 This is a controversial amendment to the state constitution, which would enshrine a specific method for handling the redistricting of congressional, assembly, and state senate districts every ten years. Common Cause NY, Sen. Liz Krueger, New York City Council Progressive Caucus, Make the Road Action Fund, New York Times, VOCAL-NY, many others. This is an amendment that allows the state legislature to distribute bills to the members electronically, instead of in printed form. This is a controversial amendment to allow the state to sell 2 billion dollars in bonds to fund improved technology in school classrooms, and other educational needs. On this November's ballot, voters in New York State will have the chance to vote for an amendment to the state constitution which would change the system of redistricting that occurs every ten years. While NKD has not (yet) taken a position on this proposal, we believe strongly in the ultimate goal of a fair, independent redistricting system. The text of the proposal can be found here. On Tuesday September 30, we were visited by speakers advocating both sides.